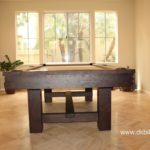 Our Newport Coast, California customers made use of a formal living room space by turning it into a fun billiards room. The 8′ Elkhorn Rustic looks great with Teflon felt in khaki. 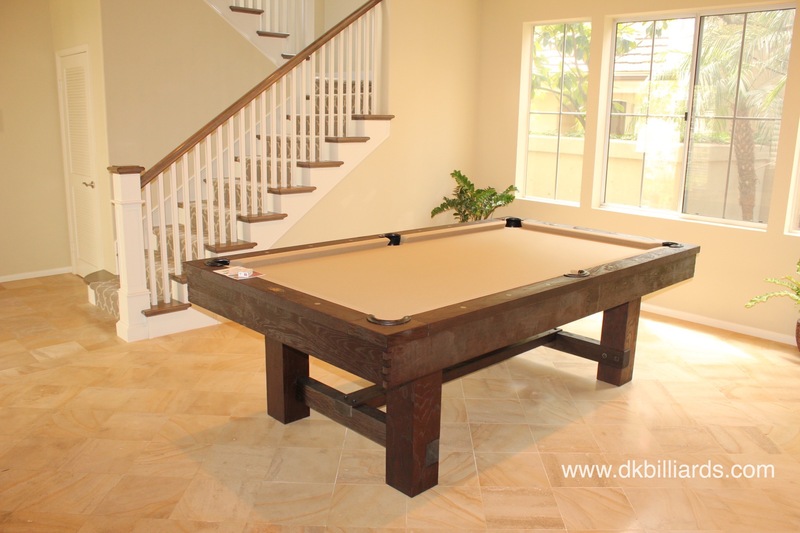 This rustic pool table is solid wood and features a three piece one inch slate and k-66 cushions. The dark stain is enhanced by the scraped finish to give it the look of reclaimed wood. 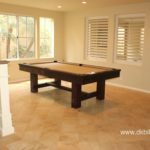 It is also an affordable option in comparison to other big name rustic pool tables. 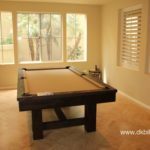 Our pool tables are professionally installed for the most accurate play and peace of mind. Visit our OC Pool Table Showroom in Orange to view the Elkhorn and many other tables to fit your style and budget. Hi, I was interested in the 8′ elkhorn with the camel felt. Can I get an estimate on the price for this pool table?